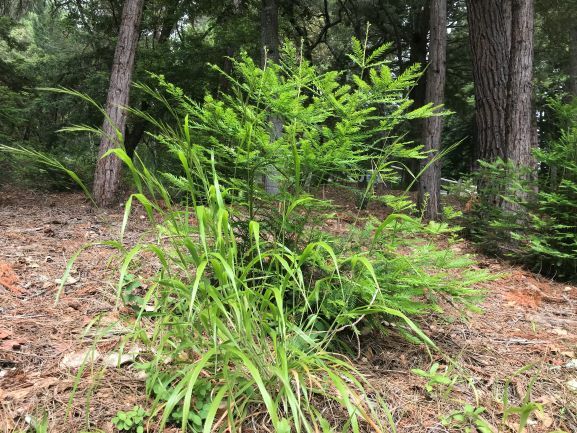 The San Mateo RCD and the Midpeninsula Regional Open Space District (MROSD) have partnered up to protect the biodiversity of our forests from slender false brome, but we can’t do it without you! Fast growing and extremely aggressive, slender false brome (Brachypodium sylvaticum) inhibits growth of tree seedlings and replaces surrounding vegetation. It can cover up to 90% of the ground if not managed — outcompeting pollinator-friendly plants and preventing water from penetrating the roots of larger tree species. 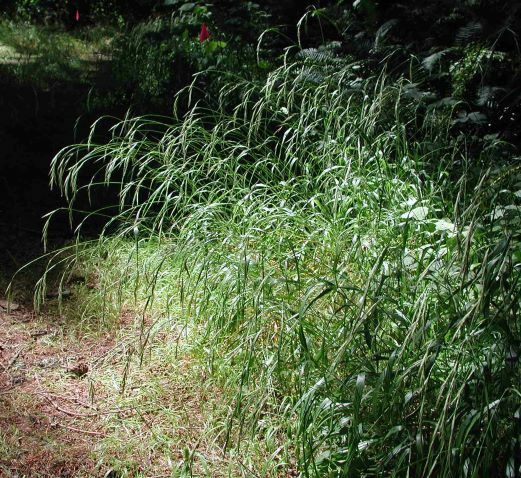 Slender false brome is currently in the Woodside and La Honda area, the only known location in California. 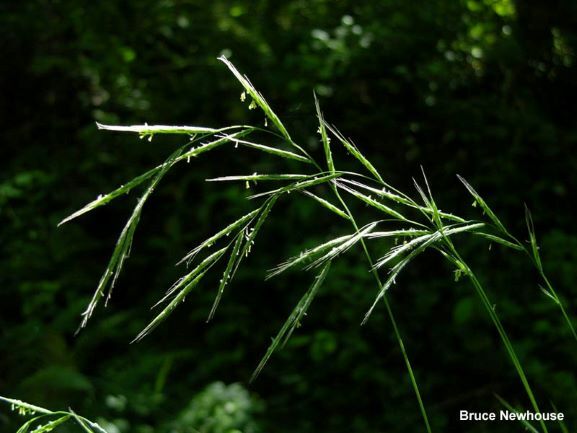 Please join your neighbors and the San Mateo Resource Conservation District in the effort to contain slender false brome! Stay Vigilant! SFB can be spotted any time of the year. 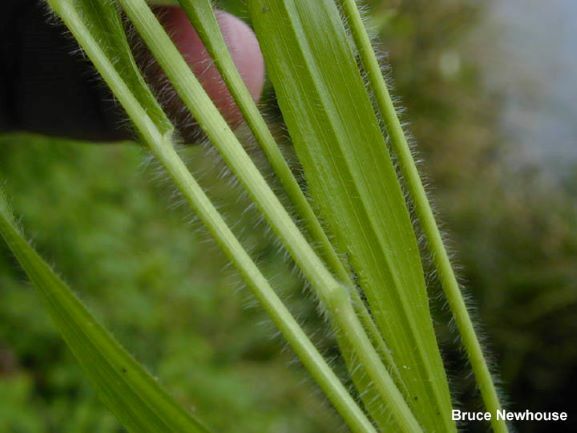 Learn how to identify slender false brome for your home and out in the wilderness. Stay Clear! Always clean your clothes and shoes before and after you leave public or private trails. Use a stiff bristle brush to remove any weed seeds on your clothes and shoes. Make sure to get anything hiding between the grooves of your shoes! Get Surveyed! It’s important to know if you have SFB on your property. Schedule a site visit with the RCD. We’ll survey your property (free of charge) and inform you of any SFB on your property. Get Treatment! There are many options for removing SFB from your property. Small infestations can be hand pulled using your hands and a spade with any other weed. Larger infestations may take some help from the RCD who can offer a range of treatment options from hand pulling, mulching to chemical. For the DIY’er, we recommend removing the whole plant, including most of the roots. Using a spade or other digging tool will help you when soils are dry. I recommend a good hori-hori but be careful of its sharp edges! If you have a larger infestation, and are debating using chemical means, please refer to the herbicide label for environmental and human safety. 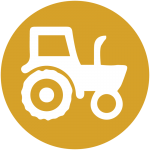 Also check in with your local pesticide regulator about herbicide restrictions in your area and for best management practices when using chemicals. 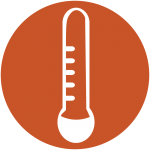 If you would like to remove SFB on your own, we offer reimbursement of $415 per infested acre (acreage is predetermined by the RCD). Contact the RCD to find out how to get involved in the reimbursement program. Slender False Brome (Brachypodium sylvaticum) is an invasive perennial bunchgrass originating from Europe, Asia and North Africa. Charmed by its year-round wide green foliage, Brachypodium sylvaticum was introduced to Oregon as an ornamental. This plant easily escaped into the wilderness and infested the Oregon west Cascades, now reaching over 10,000 acres. The grass forms a dense matt—shading out low growing plants and seedlings. It grows in a variety of conditions from full sun to shade, in habitats such as redwood, evergreen, riparian, oak woodland, and from sea level to 3500 feet. The plant is not palatable to wildlife or domestic animals and responds well to fire. Brachypodium sylvaticum adaptive nature makes in a high-priority invasive plant. Within San Mateo County, Brachypodium sylvaticum was discovered in December 2003. By then it had already spread through Woodside, CA—into (MROSD) Thornewood Open Space Preserve and surrounding private property. 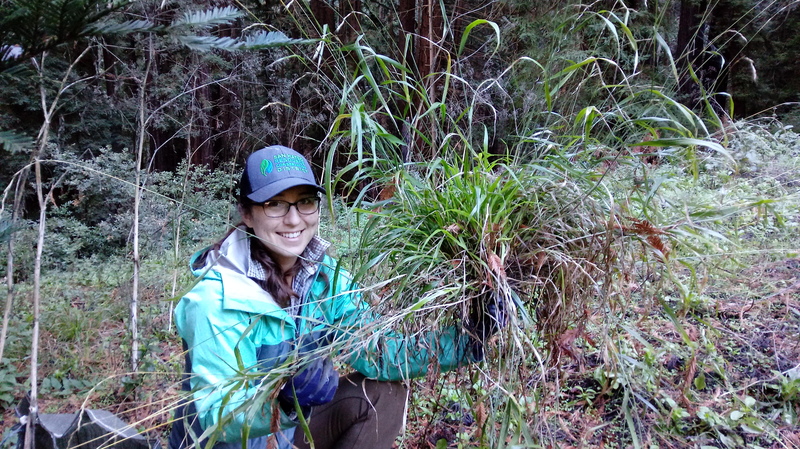 MROSD began a program in 2009 to treat Brachypodium sylvaticum on private property. 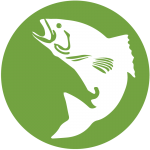 The project has since moved to the RCD, who specialize in resource conservation on private lands, still funded by MROSD. Brachypodium sylvaticum exists within California in San Mateo County and Santa Cruz County. Out of the two counties, the population within San Mateo is the largest, at an estimated over 300 acres. The other two populations are small satellite populations. The Santa Cruz location is under management by State Parks and Sempervirens. Within San Mateo, Brachypodium sylvaticum threatens San Francisquito, San Gregorio, and Tunitas watersheds, the former being the most infested and the later being the least infested. The San Francisquito watershed has the largest populations of Brachypodium sylvaticum. Dennis Martin Creek has populations at >75% cover over acres of land. These populations feed into San Francisquito Creek where Brachypodium sylvaticum is found within Jasper Ridge Ecological Preserve and an outlying population in Menlo Park. 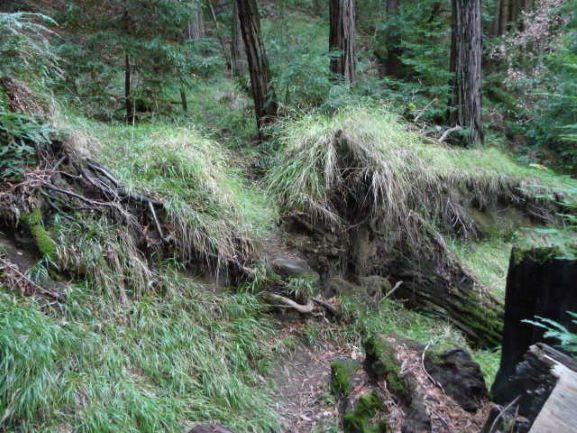 Within the San Gregorio watershed, Brachypodium sylvaticum is strictly within La Honda and San Gregorio Creek, almost reaching Highway 1 and the ocean. Slender False Brome is a bunchgrass, distinct by its glossy green leaves that stay bright through summer. Seeds hang from tall stalks, and the stems and edges of leaves are sparsely hairy. 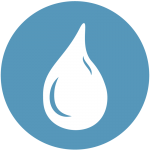 Learn more by reading our identification guide!